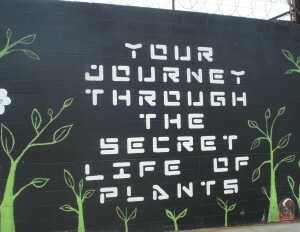 At the far Western end of 30th Avenue, close to the East River and the Welling Court Mural Project, is Two Coves Community Garden. A mesh fence encloses a triangular patch of land split up into 130 gardening plots. Early last Sunday morning the garden was already bustling with activity. I spoke with Two Coves member Lynne Serpe. While we spoke, she was weeding and digging a new plot that had become available, getting it ready for its gardener. That was in 2006. Lynne got involved in January 2008 when there were about 12 people gardening there. By the end of that year there were 80. Now, around 250 people use the garden. Most of the plots have more than one gardener, and there is also a community plot for people who are on the waiting list or who don’t have enough time to look after a patch of their own. A division of the Parks Department called Green Thumb licenses Two Coves. The gardeners do not own their plots: they are encouraged to pay a membership fee of $20 per season, and expected to maintain their plot and do a couple of hours volunteer work each month. “It’s an incredibly diverse garden,” says Lynne. “In 2009, the last time we counted, there were 40 languages spoken here. 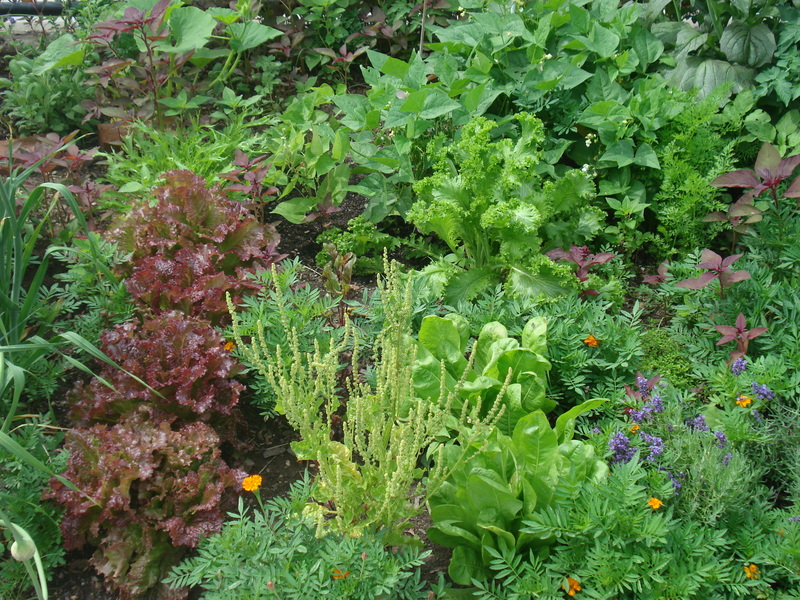 And if you walk around the garden – if you know something about different cultures and food – you can kind of guess which plot might belong to, for example, Bangladeshi gardeners, or Caribbean gardeners who may be growing callaloo, choy, things like that.” The garden gets a lot of sun, which means a lot of different things can grow. The gardeners can come and go whenever they please. 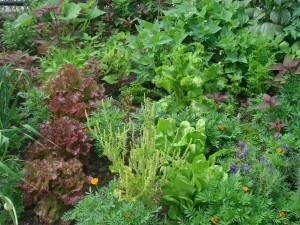 Some garden at unpredictable times; while I was there, two air stewards who Lynne rarely sees were gardening their plot. Lynne said for that reason the parties and barbecues that Two Coves throws from time to time are an important way to bring all the gardeners together. When the garden first started some of the plots were big. But as more and more people have wanted to get involved they introduced a rule to standardize the plots at around 100ft each. That may seem small, but “you can pack a lot in,” says Lynne. Lynne moved to Astoria in 1994 after graduating from college. 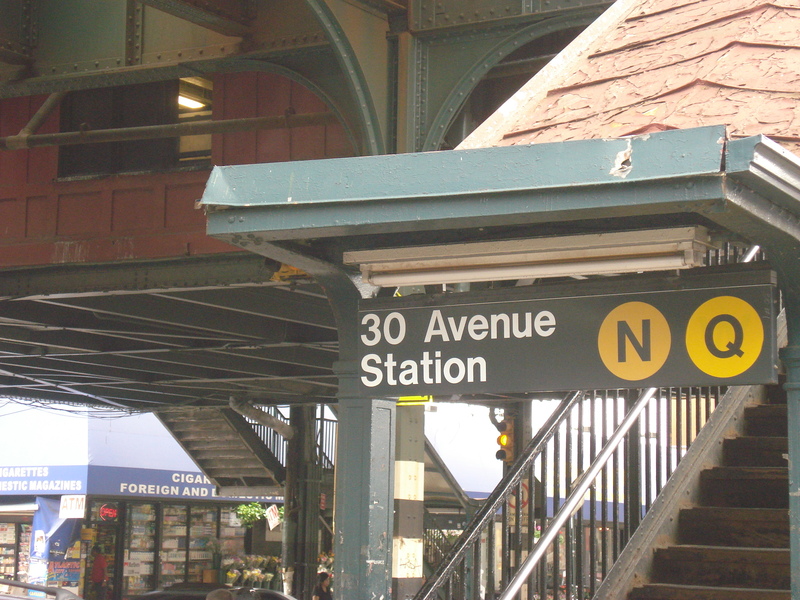 First she lived at 37th Street and 31st Avenue. She works as an independent contractor on political campaigns, which sometimes takes her to different parts of the country or overseas for periods of time. But she always comes back to Astoria, and always in the 31st, 30th Ave area. She works in all kinds of ways to help make Astoria greener. She co-founded the organization Triple R Events: Reduce, Reuse, Recycle that organizes environmental activities throughout the neighborhood. And in 2009 she stood as a Green Party candidate for the NY City Council. 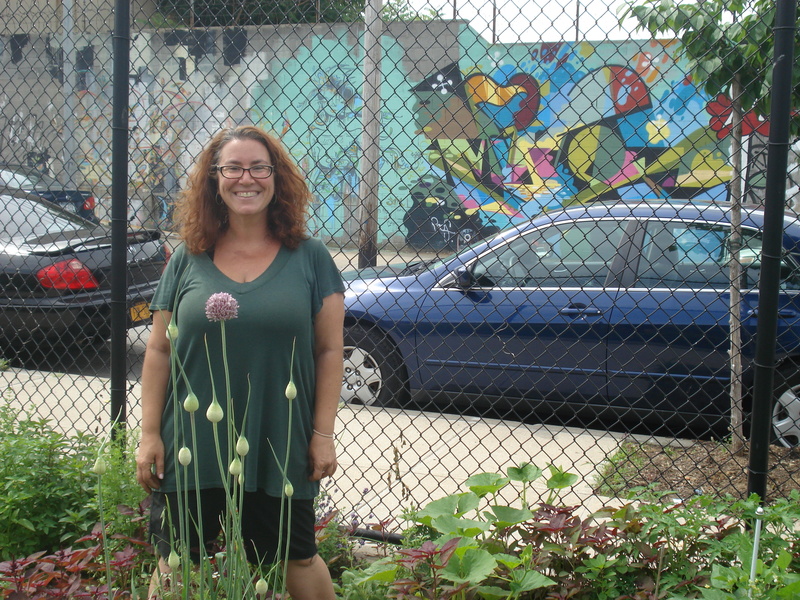 At the moment, Lynne is working with Queens Library, helping to spread gardening and living green with a “Greening Libraries” initiative. 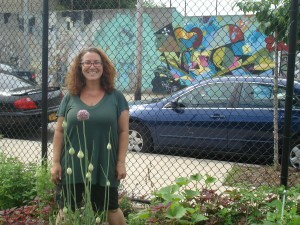 As just one part of the project she and her colleagues have created three gardens at nearby libraries. The Astoria Library on Astoria Boulevard and 14th has a Shakespeare garden, in which all of the plants appear somewhere in a work of Shakespeare. The courtyard at the Steinway Library by Ditmars does not get a lot of sun, so they have planted a shade garden with root vegetables like carrots, turnips, beets and radishes. And at the library in Woodside, which doesn’t have its own courtyard, they have partnered with the Parks Department to use a triangle across the street for a butterfly garden, full of colorful flowers. About 150 people are currently on the waiting list for the Two Coves Community Garden. But the list does move. Each year as people either move out of town or become too busy, plots become available. Lynne is on the plot allocation committee which this year assigned plots to 30 new people. The Ahmad family owns TaxIntel (formerly Abacus One) on 30th Ave between 33rd and 34th Streets. 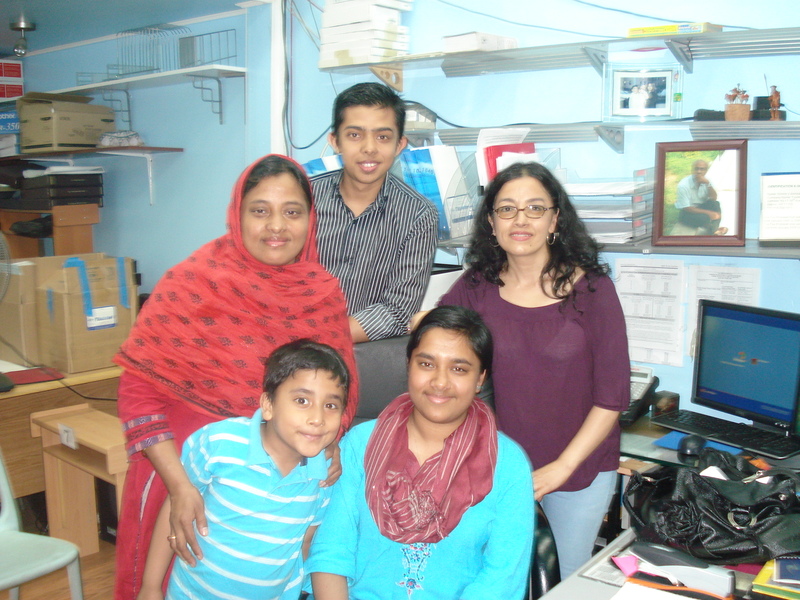 When you go into the store you are likely to find at least one member of the family: there’s Shimin the mother, Nadia (21), Nadeem (18) and Nafees (7). I only met Qazi once, when he did my 2009 tax return. Yet I remember the encounter well – his calmness, friendly smile, and conversation. Shimin says that he had that effect on people: even the shortest encounter left an impression. 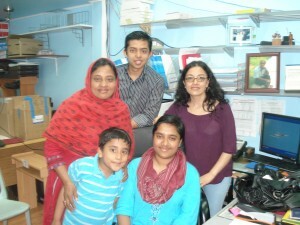 Qazi and Shimin, both from Sylhet in North Eastern Bangladesh, came to New York in the 1980s. They first lived in Manhattan and moved to Astoria in 1995. Qazi worked as an accountant and cost controller. Soon after the September 2001 attacks, the firm he was working for closed. He spent some time looking for a new job but didn’t find a good one – and decided it was time to do his own thing. When he first started the business, Qazi rented space in Printing Plus further up 30th Ave, then moved into his own space at the current location. Word of mouth meant he quickly built up a customer-base. About half of the clientele are Bengali-speaking, the other half reflect the mix that is Astoria. One day, a student asked him if she could borrow his computer for a while, and he agreed. Then she suggested he make one computer available for customers to use. “After that we had two, then three, then five computers,” says Shimin. The store now doubles up as a service center providing internet access, printing, copying and faxing. “You never know what people are going to need until people walk through the door,” says Nadia. “We’ve done wedding reception invitations, business cards, resumes…” Sometimes people come with impossible requests, like a customer who wanted color added to a printed document when the original was only in black and white. Anila Karki is a long-time family friend, originally from Nepal, who works with the internet/printing side of the business. She says, “helping customers and having small talk with them is what I enjoy most.” Often customers think that she’s Spanish-speaking and start talking away in Spanish. Nadia is studying English at New York University (and she writes a blog in her spare time). Nadeem, who wasn’t around when I did this interview, is going to be studying mechanical engineering at CCNY starting this fall. They both help out in the store, especially during tax season. During that time, Nadia says, “I run out of class and then I run onto the train, and then run off the train to come and help here. Like Nadia does, Qazi enjoyed literature and writing. “It’s a side of my Dad that we take for granted and forget that others may not be aware of,” she says. He read and wrote a lot. When he was younger, he wrote poems and short stories in Bengali. Then after he came to New York he wrote articles for local Bengali newspapers, as well as poems for small publications. Nadia says: “I always remember, especially when I was around three or four, seeing him lie on his stomach on the bed after he came home from work, with a legal yellow draft pad and paper, working on something. Years went by though, and he had less and less time for writing, but continued to spend time on his other love – taking care of his family. 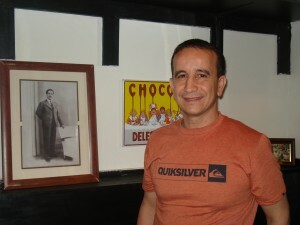 Halim is the owner of Harissa café on 30th Ave between 34th and 35th Streets. He set Harissa up nine months ago. In it, he has invested experience gained from his life so far – in particular lessons learned from the people around him. As a boy in Algiers he used to help out in his family’s kitchenware store. His grandfather started the store, then it was taken over by his father and then his brother. Halim moved to New York when he was 24. First he lived in Corona, where the one person he knew in the city lived. He quickly found work as a bus boy at Periyali Greek restaurant in Manhattan. He moved into a studio in Astoria to be closer to work – it was winter and the commute from Corona felt cold and long. He also observed the art of talking with customers. He would stand impatiently waiting to take an order, behind the owner who was busy recounting stories to the diners. He is amused to find himself doing the same in Harissa – getting into long conversations with clientele. After the ten years at Il Cantinori Halim felt it was time for a change. He went into a partnership to set up a restaurant in the city but the plans fell through. “So I decided to just give up the restaurant business,” he says. He became a limo driver. He enjoyed the reliable schedule and the free time that he had in-between drives. A book he read twice during that period, and that he relates to his own life, was Paulo Coelho’s The Alchemist. His most regular clients were an actor and actress couple. “I was not so much their driver, more like a friend. They’d invite me into the places they went, like to join them for a drink. I liked that connection. It reminded me that it doesn’t matter who you are, we’re all people. The restaurant business hadn’t let go its hold of him. At one point he was on the verge of opening a café on Vernon Boulevard, with a longtime friend. The plan was for the café to double-up as an antiques store, in which customers could buy the furniture they ate at. Then an opportunity came up to open up a restaurant on 30th Ave, and Halim took it. Third time lucky. Before it opened, he and the chef were sitting on the floor in the empty store space having some lunch – Halim had a can of Harissa, the spicy North African sauce, in his hand and that is now the café got its name. Harissa is the kind of place where people like to linger. The starting point is the coffee, served from a counter at the front. But people often go on to order food – felafel salad, lamb tagine, grilled chicken sandwiches – most of it made from ingredients bought that day from the shops nearby. Halim says that the clientele in Harissa is mainly young, and arty – people who recognize elements of East Village and Williamsburg cafés there. The décor is dark wood and pale walls hung with mirrors and unobtrusive pictures. On one, is a photograph of his grandfather who set up the store in Algiers. Sometimes, Halim swaps items from one side of the room to another – a technique that his brother used in their store to give regular customers a sense of surprise and change. 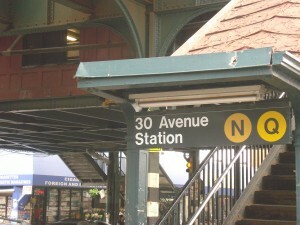 A few times a week you can find Miss Jones (Jacquie Jones) in the booth at the 30th Ave subway station. She has worked for the MTA for 14 years. Miss Jones was born and brought up in Jamaica, Queens, in a “house full of strong women.” Her father died when she was two. She and her sister were brought up by her mother, grandmother and aunt. In the summers when there was no school, she accompanied her mother to her job working as a housekeeper in Long Island. “Getting on the Long Island Rail Road and going to my mother’s job with her was how I got my people skills,” Miss Jones says. In 1989, Miss Jones moved to Astoria with her daughter. “I had put in an application for public housing and was accepted. I had a son in 1993. I took the MTA test and got the job with them in 1997. I was a single parent by then. I enjoyed living there, on my own. I don’t know why they call it the projects when it’s an apartment like any other. “But still, I always wanted to go back to Jamaica.” In 1999 she married, and did move back to Jamaica. She’s now divorced but still lives there with her son and her mother. Miss Jones works in many different subway stations. Staff rotate depending on whether they want to work mornings, afternoons or nights. She has worked on the 7, the L and the J trains, and likes to move around. The crowd that comes through the 30th Ave station is diverse. “You get all kinds of people at any time of the day or night. That’s what happens when we’re a 24 hour system.” She says that the moments she enjoys most about her work is when she does something for someone that is appreciated.